Moss Hart once said that you never really learn how to write a play; you only learn how to write this play. Crafted with that adage in mind, "The Dramatic Writer's Companion" is designed to help playwrights and screenwriters explore their own ideas in order to develop the script in front of them. No ordinary guide to plotting, this handbook starts with the principle that character is key. 'The character is not something added to the scene or to the story,' writes author Will Dunne. 'Rather, the character is the scene. The character is the story.' Having spent decades working with dramatists to refine and expand their existing plays and screenplays, Dunne effortlessly blends condensed dramatic theory with specific action steps - over sixty workshop-tested exercises that can be adapted to virtually any individual writing process and dramatic script. Dunne's in-depth method is both instinctual and intellectual, allowing writers to discover new actions for their characters and new directions for their stories. Dunne's own experience is a crucial element of this guide. His plays have been selected by the Eugene O'Neill Theater Center for three U.S. National Playwrights Conferences and have earned numerous honors, including a Charles MacArthur Fellowship, four Bay Area Theatre Critics Circle Awards, and two Drama-Logue Playwriting Awards. Thousands of individuals have already benefited from his workshops, and "The Dramatic Writer's Companion" promises to bring his remarkable creative method to an even wider audience. "The Dramatic Writer's Companion" features: more than sixty of the author's workshop-tested exercises for playwrights and screenwriters; an underlying focus on character as the root of scene and story; a unique, nonlinear format that allows the writer to use exercises in any order and as often as needed to meet individual writing goals; a special troubleshooting section that addresses common script problems; a glossary of key terms; and, examples drawn from well-known plays and films, including both contemporary and classical masterworks. Dunne has taken everything he knows from the powerful dual standpoints of an award-winning playwright and a master teacher to create the book we ve been waiting for. It s all there from every angle and every perspective how to bring fascinating, fully-developed characters in conflict out into the light and onto the stage. --Susan Stauter, artistic director, San Francisco Unified School District"
Dunne mixes an artist s imagination and intuition with a teacher s knowledge of the craft of dramatic writing. It is an irresistible combination, producing a book which is simultaneously astute "and" imaginative. . . . No one can teach anyone to become a dramatic writer. But it is possible to learn how to improve your writing skills. It is possible to be provoked into thinking differently, into adding different colours and dimensions to your ideas, to extend the range of images in your head, to startle your imagination; in short, to be inspired into trying new approaches and methods. "The Dramatic Writer s Companion" has the potential to do all of that for a writer. A breath of fresh air. Whether you re working on your first play or your fortieth, preparing a first draft or polishing up a finished piece, "The Dramatic Writer s Companion" offers challenging, thought-provokingexercises rather than formulaic how-to solutions. This is the kind of book that not only makes plays stronger; it makes writers strongeras well. --Jeni Mahoney, artistic director, Seven Devils Playwrights Conferenceand playwriting program head, Playwrights Horizons Theater School"
The practical genius of Dunne s writing lessons proved invaluable to me in the development of the script for my own film, "Mean Creek. "I have read many books on scriptwriting, most a bunch of intellectual blather about themes and structure, whereas Dunnesl s approach to writing is grounded in specific and useful exercises that a writer can actually employ at the moment of creation. --Jacob Estes, recipient of the 2005 John Cassavetes Award, Film Independent s 20th Spirit Awards for his film Mean Creek"
Will Dunne lays out all the right questions with great precision and elegance.In the process he coolly demystifies all the dramaturgical demons; they become nothing more than the routine technical challenges faced by any craftsman. --Dennis J. Reardon, professor emeritus of playwriting, Indiana University"
Dunne meets the writer on his or her own terms, eye to eye. 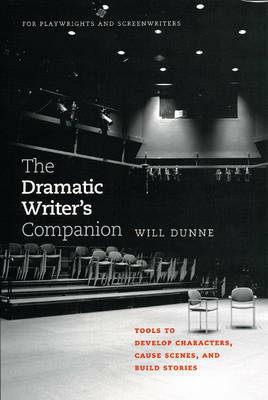 Unique, ambitious, and comprehensive, "The Dramatic Writer s Companion "contains practical writing exercises underscored by well-developed dramatic theory. --Art Borreca, head of Playwrights Workshop and Dramaturgy Program, UniversityofIowa"
In his new handbook for writers Dunne adheres to the idea that character development is essential to telling a story. . . . Dunne employs his wealth of experience as the current resident playwright at Chicago Dramatists, a Charles MacArthur Fellowship honoree, a former O Neill Theatre Center dramaturg and an award-winning author of such plays as "How I Became an Interesting Person," "Love and Drowning," and "Hotel Desperado" to give writers a blueprint on how to examine their ideas in depth in order to develop their plays and screenplays.